Summer Harvest tapestry shows a gorgeous summer fruits scene in French portiere style. 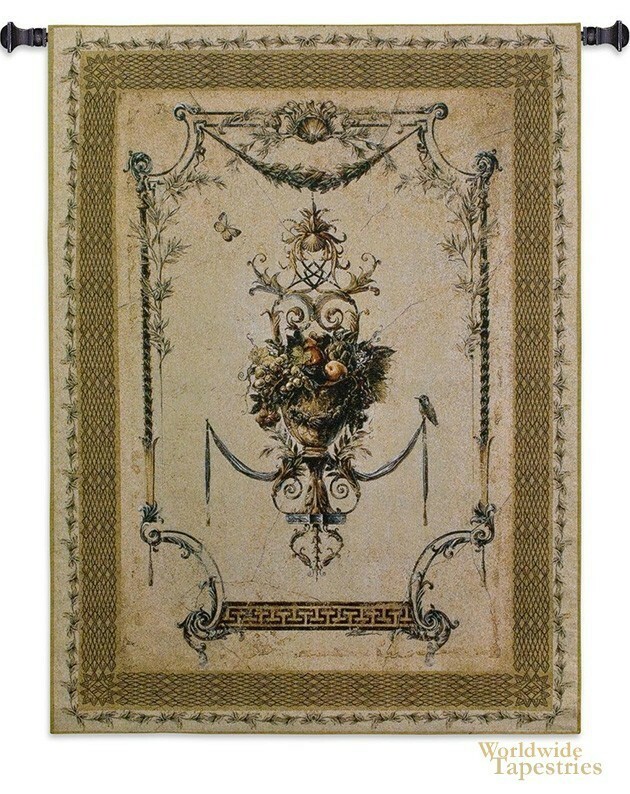 French portieres or tall tapestries have been used in palaces and castles for centuries to decorate walls and to provide a grandeur that is unmatched. Here in this gorgoeus work we see the harvest of summer such as fruits, flowers and leaves in a large ornate urn, decorated with motifs from nature such as leaves, birds and butterflies. The composition if simply beautiful, and is inspired by these traditional French portieres from centuries ago whcih were used to adorn walls of aristocrats and royalty. The color palette is masterful as it uses beighes and browns, accentuated by greens, reds and blues to create a work of immense beauty. Like it's sister work "Frutti D'Estate", this tapestry "Summer Harvest" celebrates the beauty and harvest of summer. Summer Harvest tapestry is backed with lining and tunnel for easy hanging. Note: tapestry rod and tassels, where pictured, are not included in the price.